LANSING — Want to win one of Michigan’s 14 seats in the U.S. House? Having $1.84 million appears to be a good place to start. 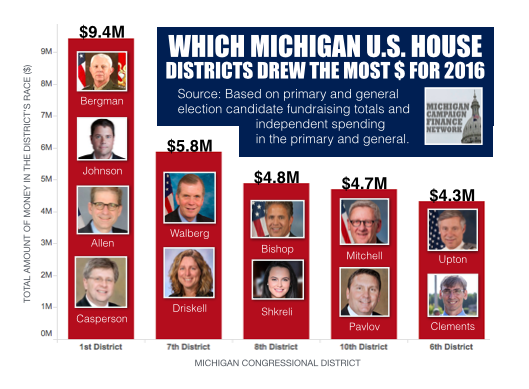 Last year, the average winner of a U.S. House seat in Michigan had about $1.84 million on his or her side, including the candidate’s own fundraising and any spending by outside groups that benefited the candidate. If the seat was open, meaning there was no incumbent in the race, the average cost of winning doubled: In the two races for open seats in Michigan, the winner averaged $3.76 million. Despite the fact that none of the general election races were close in Michigan last year, the campaigns for the 14 congressional seats drew about $40 million, according to a review of campaign finance disclosures and TV ad-tracking data. About 17 percent of that total — $7 million — came from so-called “independent” spenders that can fund unlimited amounts of TV ads and mailers to try to influence elections. The 2016 races also saw about $9.4 million flow into a single district, a nonprofit spend about $1.6 million against three candidates and one candidate drop $3.5 million into his own campaign. All of that money came despite the fact that none of the 14 general election races were closer than 10 percentage points. The closest race, the 11th District, was actually the sixth most expensive. The following is a run-down of which congressional districts attracted the most money in 2016 and where some of it came from. Northern Michigan’s 1st District was once again home to one of the most expensive general election congressional races in Michigan*. This cycle, however, it also saw a pricy primary race on the Republican side. With former U.S. Rep. Dan Benishek, a Republican, deciding not to seek re-election, former state Sen. Jason Allen, of Traverse City, current state Sen. Tom Casperson, of Escanaba, and retired Lt. Gen. Jack Bergman, of Watersmeet, vied for the GOP nomination. Allen raised $429,674 for the primary. Casperson raised $520,676. But they both came up short against Bergman, a political outsider who heavily self-funded his primary campaign. The GOP primary race also saw a flurry of independent spending. Concerned Taxpayers of America and U.S. News Network spent about $217,682 to attack Casperson, who came in second. Concerned Taxpayers of America was funded in part by members of the DeVos family. U.S. News Network was backed by political consultant John Yob and a firm tied to new Michigan GOP Chair Ron Weiser. Defending Main Street SuperPAC spent $202,000 in support of Casperson. 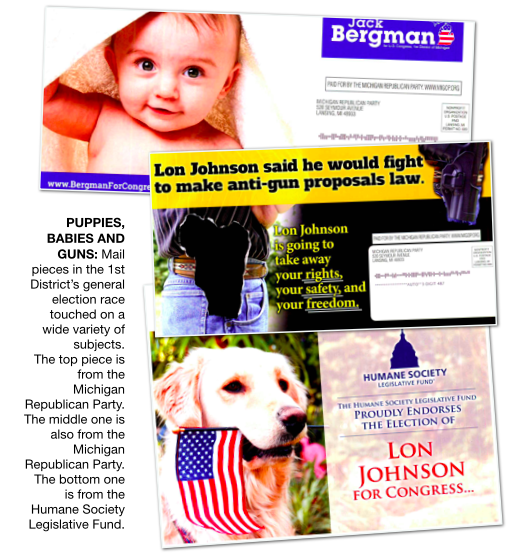 Bergman, who reported raising $1.3 million in the 2015-2016 cycle, faced off against former Michigan Democratic Party Chair Lon Johnson, of Kalkaska, in the general election. Johnson reported raising $2.0 million for the cycle. Further driving up the cost of the race was heavy independent spending in the general election. On Bergman’s side were the center-right nonprofit American Action Network, which spent about $559,262 in the 1st, and the National Republican Congressional Committee, which spent $1.7 million. On Johnson’s side were the Democratic Congressional Campaign Committee, which spent $962,332, and the House Majority PAC, which spent $1.3 million. In the end, Bergman notched 55 percent of the vote while Johnson got just 40 percent. The general election race between U.S. Rep. Tim Walberg, a Republican from Tipton, and state Rep. Gretchen Driskell, a Democrat from Saline, was the second most expensive congressional race in Michigan last year. It largely played out on TV screens in southern Michigan. The major party candidates in the 7th raised more money for their own campaigns than in any other district in Michigan last year. Walberg reported raising $2.4 million for the two-year cycle with $1.1 million of that total coming from other political action committees. Driskell reported raising $2.5 million with $533,228 coming from political action committees. 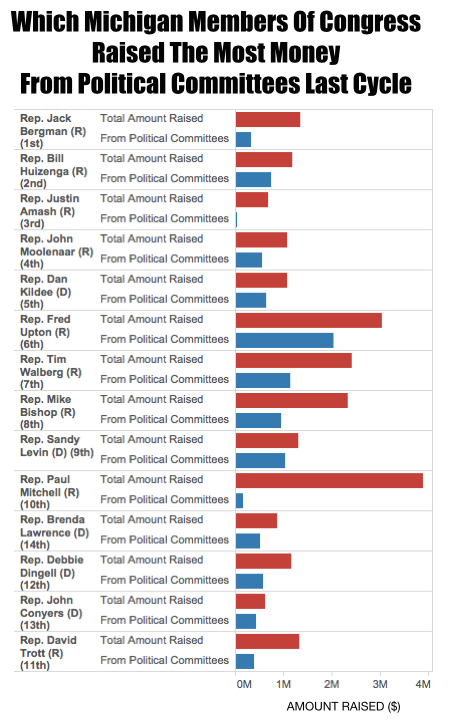 On top of those big numbers, the House Majority Fund reported spending $559,264 independently to try to help Driskell while American Action Network reported spending $309,195 independently to try to help Walberg. Much of the spending went to TV advertising with about 8,500 broadcast TV ad spots aired in the race across the Lansing and Detroit markets, according to tracking by Kantar Media/CMAG. That’s one ad spot for every 39 votes cast in the race. The voters picked Walberg, who got 55 percent, over Driskell, who got 40 percent. The 8th District may have ended up higher on this list had actress Melissa Gilbert, a Democrat, not dropped her bid to challenge U.S. Rep. Mike Bishop, a Republican from Rochester. Gilbert’s campaign had attracted about $803,985 in contributions before she withdrew in May 2016. Democrats then turned to Suzanna Shkreli, a Macomb County prosecutor from Clarkston. Shkreli ended up raising $780,514, a fraction of what Bishop raised. He brought in $2.3 million. Bishop also got a boost from American Action Network, which describes itself as a center-right “action-tank.” American Action Network spent $713,611 independently of the Bishop campaign against Shkreli. That was more than it spent on any other race in Michigan. The Democratic Congressional Campaign Committee spent a smaller sum, estimated at about $255,795, to try to help Shkreli through ads it ran in an unusual co-sponsorship arrangement with her campaign. Bishop defeated Shkreli by more than 17-percentage points on Election Day. No one spent more of his or her own money last year to try to win one of Michigan’s seats in Congress than Republican businessman Paul Mitchell, of Dryden, did in 2016. Mitchell provided about $3.5 million through contributions and loans for his own campaign, according to disclosures. His campaign ended up bringing in about $3.9 million, more than any other candidate’s campaign in Michigan. The burst of money helped Mitchell, who ran and lost in the 4th District in 2014, win the open 10th District seat two years later. He easily won the general election race over Democrat Frank Accavitti Jr. by more than 30-percentage points. In the primary, he defeated four opponents, including two sitting state lawmakers, Phil Pavlov, of St. Clair, and Anthony Forlini, of Harrison Twp. Term limits have since forced Forlini out of the Michigan House. Pavlov raised $402,318 for his campaign. Forlini raised $122,157 for his campaign. No major outside spenders came in to help Pavlov or Forlini fend off Mitchell’s big money tidal wave. Mitchell got 37.9 percent of the vote in the primary. Pavlov finished in second place with 27.7 percent. Former state Sen. Alan Sanborn got third place with 15.9 percent. Forlini came in fourth place with 9.9 percent. Rep. Fred Upton, a Republican from St. Joseph, was first elected to the U.S. House in 1986. With a big money advantage, he won another term in 2016. Upton reported raising $3.0 million for the 2015-2016 cycle with $2.0 million coming from other political committees. He received $10,000 from numerous PACs, including PACs for DTE, Exxon Mobil, Ford and Pfizer. Just two years earlier, Upton beat Clements by a 15-point margin. While it was a different election season, Clements was boosted by $2.1 million in spending by a Super PAC in 2014. In 2016, Clements received only $12,000 in reported independent spending. — 13th District, Rep. John Conyers, Republican of Detroit: $722,999. 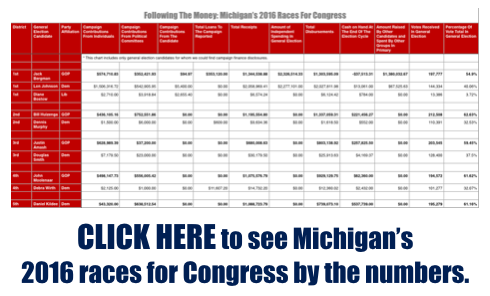 A full look at the money in Michigan’s 2016 congressional elections is available here. * The 1st District has not seen the most expensive congressional race each of the last three cycles. It's been among the most expensive each cycle and was the most competitive in terms of the general election results in 2012 and 2014.